Infant stroller is an essential product for parents on the go. But before buying a stroller for your precious infant, you need to pay heed to some considerations. First, consider the configuration of the stroller. You have the options to choose Infant-only Stroller, regular stroller or convertible stroller. Infant-only Stroller: This type of stroller is simple and lightweight and can accommodate an infant car seat. You can use this type of stroller only at your baby’s infant stage. Luckily, such type of stroller is not expensive. 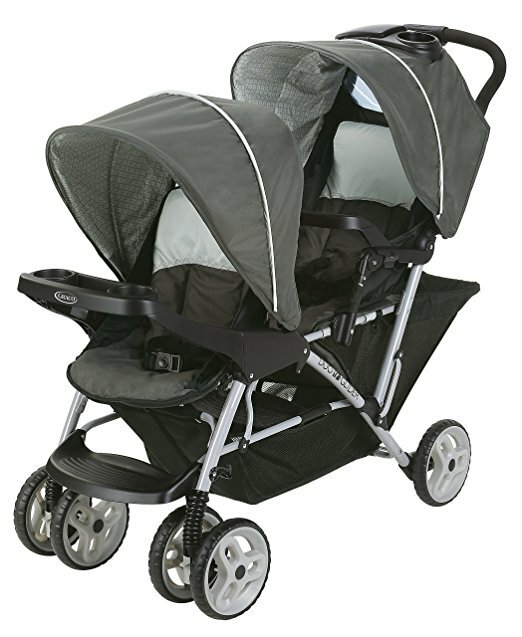 Regular stroller: You can choose a regular stroller with infant insert. Convertible stroller: Such type of stroller is perfect to use for babies infancy to toddlerhood. However, it is not an easy task for a first-time parent to choose the quality stroller for their infant. To make this difficult task easy for you, we have done an extensive research for you and finally pick five Best Strollers for Infant to narrow down your list. Take your time, Go through our expert’s informative and helpful review to make a smart choice for you and for your infant. Are you waiting to buy a super lightweight, most feature rich convenience, yet budget friendly stroller for your infant? Then, pick the most popular Summer Infant 3Dlite Convenience Stroller without any hesitation. Featuring with air-light aluminium frame, this stroller is easy to push and carry for parents. Large, adjustable and detachable canopy with flip out sun visor. Rear storage pocket and decent storage basket offer you plenty of storage space to accommodate all your essential that you need while on the move. Five-point harness keeps your little one secure and comfortable. The harness is adjustable in three height positions as your child grows. The additional padding ensures your passengers a comfortable ride. Despite some cons, the stroller has so many great features that it still worth to buy. Although this good lightweight stroller is easy to take along, it isn’t as flimsy as so many other strollers of its class. Unlike other cheap umbrella strollers, its reclining seat offer a certain degree of comfort to your baby. The handlebar of this stroller is also well-suited for taller parents as well. Absolutely, you should love this stroller and everything about it! Looking for an ideal stroller for your twins or a baby and toddler? As a parent of two, you know well how difficult it is to get out and about to run errands with your babies. No worries! Graco DuoGlider Click Connect Stroller is just what you need for your two little ones. This sturdy and functional stroller makes walking with your children a breeze. To meet the needs of your growing family, this stroller seems to be just right for you. Its stadium-style seating arrangement allows the rear seat slightly raised so that the child sitting in the rear has a better view. Even though it is a perfect double umbrella stroller, it is extremely easy to maneuver and surprisingly light when pushing. 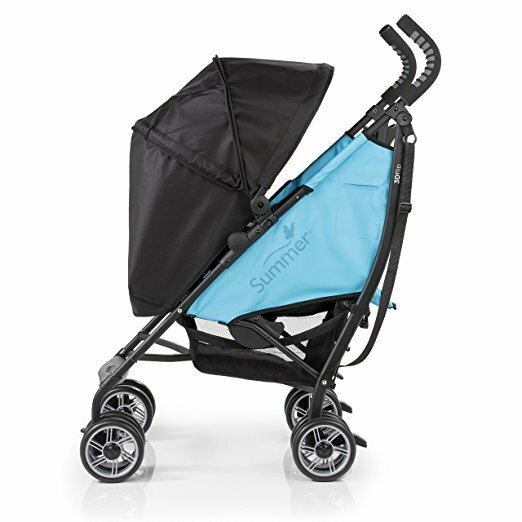 This stroller is compatible with Any SnugRide Click Connect car seat. Featuring with 2 reclining seats with canopies and footrests, child’s tray, super easy to put together, easy to fold, extra large storage basket, parent’s tray, this stroller is perfect for your growing family. One-hand, the self-standing folding mechanism allows you to fold it easily with just one hand. Two reclining seats with individual canopies and footrests ensures the maximum comfort of the little passengers. The rotating canopy provides great shade and protects your baby from the sun. Rear Seat reclines completely flat to provide backrest for the little passenger. Extra large, easy access basket holds every essential that you and your baby need while on the move. The downside of this stroller is negligible in comparison with its great features. While most double strollers feature side-by-side seating arrangement, Graco DuoGlider Click Connect Stroller is a train style lightweight double stroller that features lifted the rear seat to allow the baby in the back enjoy the nature completely. Are you searching a lighter and simpler stroller at a competitive price? Costzon Foldable Baby Kids Travel Stroller is a good quality, practical stroller. It is very strong and super easy to assemble. Its foldable design and a lot of practical features make it one of the most versatile stroller of its class. The folded stroller is just like a small box that doesn’t occupy more space in the trunk. The adjustable reclining seat provides comfort to your baby when he/she want to sleep or rest the back from a sitting position to a nap. Compact and portable folding system is easy and simple. When folded its size becomes only 33.5’’ x 20’’ x 15.7’’(L x W x H). Adjustable Reclining seat reclines to a flat position to provide maximum comfort to your child nap on the go. Although most of the user comments that the stroller is easy to assemble, they also complain that the directions are a bit confusing. Also, hope that that’ll be written a more simple way with picture. No doubt, this is a decent stroller at a competitive price. Good value for the money. You should be satisfied with this purchase. Best For 6 months and older, weighing up to 50 lbs. Do you like to keep an eye on your little angel while strolling? Then, Summer Infant 3Dflip Convenience Stroller is an excellent choice. Its innovative design makes it a Mom-friendly stroller that can easily switch between rear and front facing as your baby grows. Its unique reversible seat allows your baby to ride in rear facing or front facing. Featuring with air lightweight aluminium frame and high handlebar, this stroller is effortless and comfortable to push and carry. It has padding along the straps and seat to make it more comfortable for your little one. The rear facing seat features a padded infant head support that provides safety and comfort to your newborn. You can use the seat for infants without having to install a car seat. Large Canopy is extendable and adjustable, that block the harmful sunrays. Its height adjustability feature allows shorter or taller child to accommodate comfortably. One hand reclining seat is adjustable in six different positions that allow you to raise or lower the seat according to your little one’s preference. Trunk friendly folding system makes the stroller a perfect travel companion. Featuring with carrying strap and auto lock, this stroller is hassle free to carry on the subway or through the airport. The innovative design is not only comfortable for the parents pushing the stroller, but also for the child. Stroll your baby to have your baby face or out! Definitely, a great stroller for active parents. 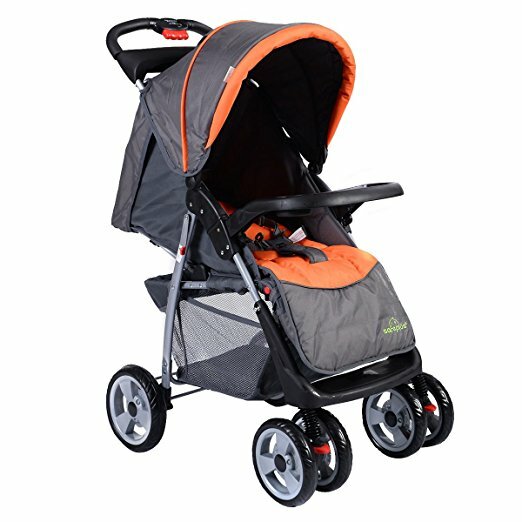 If you are looking for a jogger/walker that you can use anywhere, Baby Trend Expedition Jogger Stroller is the best option for you. This is a great and practical stroller. 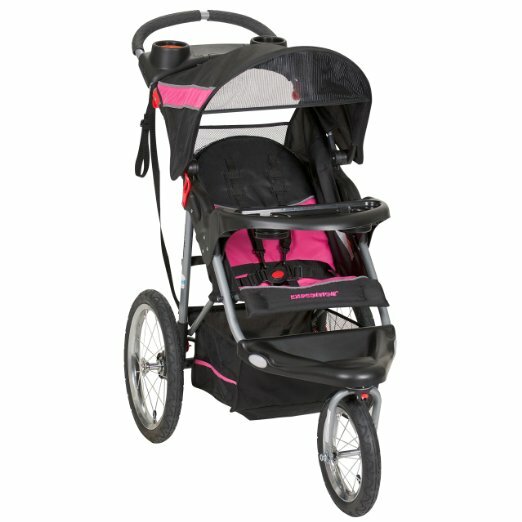 Whether you’re jogging or not, the stroller is very occupant-friendly and is a dream to navigate. This lightweight, yet durable and convenient stroller allows active parents to bring their little ones wherever they go. Its front swivel wheel, adjustable canopy with peek-a-boo window, child tray, fully adjustable, five-point safety harness and multiposition reclining seat keep your child safe and sound while on the move. 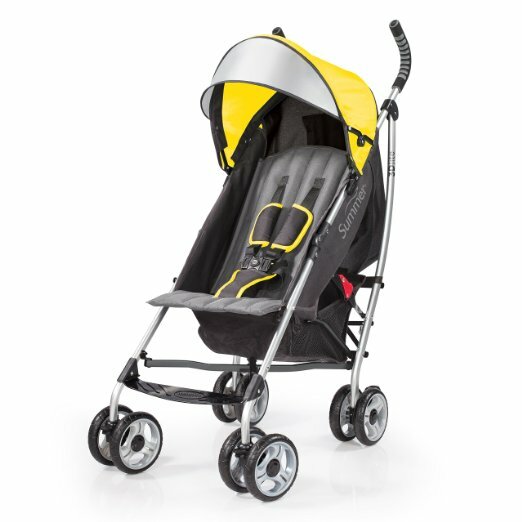 Lightweight steel frame makes it easy to push. It is literally like pushing air around. All Terrain Bicycle Style Tires offer you a smooth rolling. This stroller is easy to maneuver not only on flat surfaces but also on the gravel and grass. Two-handed trigger folding mechanism is fairly easy. It comes with a manual fold lock, and it self-stands. Parent and Child Tray with Cup holders positioned at the jogger’s handles that allow you to store your refreshment and stay hydrated. Despite some negligible downsides, this stroller is overall a true jogger. The lighter weight and smaller size combined with the self-standing feature make the stroller easier to manage, lift, and fit in smaller spaces. To have daily adventures with your little one, there is no other better option than this. You will not go wrong with this. We’ve tried our best to provide you honest buying advice that you can trust. Hope, after going through our informative reviews you’re now equipped with sufficient information to choose the best infant stroller for your family. Find the right pick for your needs and lifestyle? Buy the best strollers for infants and introduce your little one to the world!